ON THIS DATE (September 8, 1948) ... A couple of stirring comebacks enabled the Red Sox to increase their lead in the American League pennant race, as they walloped the New York Yankees with a 10 to 6 decision before 33,775 roaring fans at Fenway Park. The Yankees employed four pinch hitters and five pitchers. They opened the game with a four-run splurge off Sox starter, Joe Dobson, and fought back to a 6 to 6 tie later in the game. But in the end, the Yanks ended up 2 1/2 games behind the American League pacemakers, who have now won eight in a row. At the proper moments, the Red Sox had the pitching, the hitting and the fielding. Earl Johnson did a great relief job on the mound and Dom DiMaggio ignited a five-run first inning and a four-run seventh inning. Dom and Johnny Pesky both turned in a pair of thrilling catches during the game. It started out as though it was all Yankees. In the first inning they hit nothing but line drives and piled up a four-run advantage. But the Red Sox wiped this out the first time they went to bat, with a five-run outburst that had the fateful following then jumping out of their seats. Snuffy Stirnweiss launched the fireworks for New York with the first pitch he saw, by singling to left. He raced to third as Tommy Henrich singled to right. Hank Bauer then dropped a single into short left to score Stirnweiss. Joe DiMaggio next blasted a single to center to bring Henrich across. Dom DiMaggio fumbled his brother's ball and Hank Bauer was sent in to the plate for the third run, as big brother ran down the second. Yogi Berra calmed things down with an out, but Bobby Brown singled to bring in Joe D. An error by Dobson put Phil Rizzuto on base and then Gus Niarhos lined a shot straight at Vern Stephens, who snared the liner and tossed over to Billy Hitchcock ending the barrage. If the Yankees thought they had the game sewed up with their first inning, 4 to 0 lead, they were soon shaken out of the dream. Dom DiMaggio blasted a fastball from Spec Shea into left field for a single and the merry-go-round started, not stopping until they had batted all the way around. Johnny Pesky clipped a curveball and sent it soaring into left-center field for a double that sent Dom over to third. 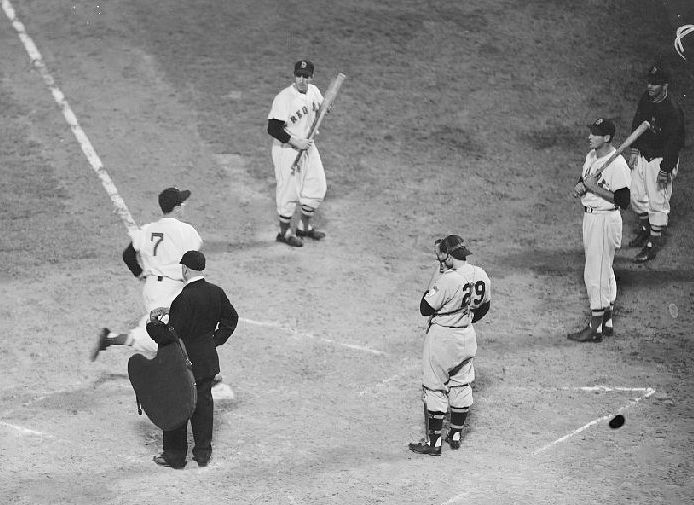 When Ted Williams came to bat the crowd was roaring and Shea pitched to him with care. He fed him nothing and Ted quickly had the count at 3-0. The next serve was also a ball but Ted checked his swing and the ball hit his bat, trickling down to Bobby Brown at third-base. As Brown picked it up and fired over to Henrich at first to retire Ted, Dom scored the first Red Sox run and Pesky went over to third. After Vern Stephens struck out, the bottom half of the Red Sox order went to work. Wally Moses bounced the ball over the mound and ran as if he were still 22. Stirnweiss came up with the ball behind second and never had a chance to get him at first while Pesky scored. Billy Goodman lined a single to right and the tying runs were on base. It didn't take Birdie Tebbetts long to bring them home. He took a Shea fastball and sent it off the centerfield wall, just to the right of the flag pole for a triple and the score was tied ... but not for long. Billy Hitchcock came to the plate and took the first pitch he saw to left for single that scored Tebbetts and put the Red Sox ahead, 5 to 4. The Sox went in to a 6 to 4 lead in the fourth inning with Allie Reynolds pitching for the Yankees. Hitchcock opened with a single and was sacrificed along by Joe Dobson. He took third as Dom raced out a slow roller to Stirnweiss for an infield hit. Pesky's deep drive to Joe DiMaggio brought Hitchcock home with the sixth run. Yogi Berra belted a long home run into the Sox bullpen to cut the score down to 6 to 5, in the sixth inning and the Yankees tied it up in the seventh with an unearned run. With one out Stirnweiss reached first on a boot by Billy Hitchcock. He took third on Henrich's line drive single to right and scored when Hank Bauer flew out to Dom in center field. Joe D. then slapped a hot roller down to Pesky and as he went down for the ball, it took a bad bounce over his head for a base hit. With Berra coming up, manager Joe McCarthy didn't hesitate and called in Earl Johnson from the bullpen. Johnson disposed of Yogi easily on a soft roller down to Goodman at first. But now the score was 6 to 6 and once again Dom got them going. He pasted a fastball off the left-field wall for a double and Pesky sacrificed him over to third. The Yankees went into the shift for Williams and he rolled softly to Stirnweiss but the speedy younger DiMaggio broke for the plate and scored sliding behind Niarhos, putting the Sox ahead. Pitcher Joe Page was furious but the Sox were even hotter. Vern Stephens singled to left sending Williams over to second and Page lost his control and couldn't locate the plate. He walked Bobby Doerr who was pinch hitting, and Billy Goodman on a three and two count. Goodman's free ticket brought home Ted. It also brought in Frank Hiller to pitch. Tebbetts rolled a potential double play ball down to Phil Rizzuto, who fired it over to Stirnweiss, but as he crossed the bag and started his throw to first, he was taken out by Billy Goodman upsetting the potential twin killing. That brought home Stephens with pinch runner, Sam Mele, coming home on a single by Billy Hitchcock to right to close the scoring. Dom DiMaggio was the fielding star of the game. In the ninth, he streaked far too was left to grab Tommy Henrich's tagged line drive, that had extra bases written all over it. Pesky came up with a spectacular catch to end the game, leaping him to grab Joe DiMaggio's bullet like smash. The ball bounced out of his glove but on the way down the ever alert Pesky grabbed it again. Billy Goodman's first inning single extended his consecutive game hitting streak to eleven. Their win was the sixth straight for the Red Sox this season over the Yankees. It was the 10th Sox win in 15 games with the Yanks. The 2 1/2 game edge the Sox have in the pennant race is the largest lead they have enjoyed this season. The Sox were 11 1/2 games out of first on May 31st and climbed to the top by winning 68 and losing only 26.